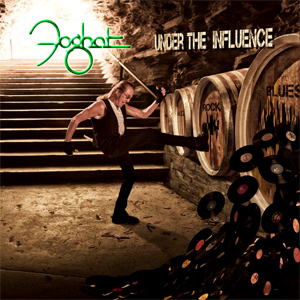 FOGHAT comes full circle with their new album Under The Influence, releasing Friday, June 24th. Drawing from their collective musical influences, the band not only brought in some special guests from their past who helped launch and inspire the FOGHAT story, but also invited some new friends into the mix to continue the journey of this never idle band. With their resident genius, guitarist Bryan Bassett at the helm, the project was going slow since Bryan was doing triple duty, playing, writing and recording the tracks, while in the midst of a FOGHAT tour. So Tom Hambridge came aboard. According to Roger Earl, "I met Tom when presenting 3 awards to Buddy Guy and Tom (his producer) at the Memphis Blues Awards. Tom said that he was a fan, and would love to produce a FOGHAT record. Putting that in the back of my mind, this was the perfect opportunity. Tom came down to Boogie Motel South to meet the band and we clicked and started writing together immediately. Working with him was inspirational! During this time, an opportunity arose for some ‘other’ recording at Dark Horse Institute in Nashville for a friend's graduation project. Scott, Bryan and Roger recorded 6 tracks and a new ‘band’, earl and the agitators, with Scott Holt as lead guitar/vocals was born. They are now playing some dates opening for FOGHAT with Roger and Bryan doing double-duty. This great experience prompted FOGHAT to move the recording of Under the Influence to Dark Horse Studios where they brought in two of their major influences. FOGHAT was ‘spawned’ from the British Blues band SAVOY BROWN in 1971, so it was fitting to ask SAVOY founder and guitarist Kim Simmonds to join in. As Roger Earl puts it “Kim gave me my shot!” As soon as Kim started playing, everyone was mesmerized! Included on this release is a new recording of "Slow Ride” to celebrate the 40th anniversary. They invited Nick Jameson, (original bass player and producer of "Slow Ride" on the 1975 Fool For The City album) to play along with FOGHAT bassist Craig MacGregor, who played bass on FOGHAT Live (1977). They had a blast, and FOGHAT lead singer, Charlie Huhn, was as usual at the top of his game with his incredible vocals and guitar work! "She’s Got A Ring In His Nose"